It is not just the fact that Ariel Mitchell's work is new and different that makes it worth getting excited about, but more important is her work's excellent expressive quality with which she connects deeply to the viewer, practically on a primal level. And there is also the fact that Mitchell doesn't just toss her ideas away after completing a piece, but rather that she develops each idea through a whole spectrum of media, until she has created a complete multimedia study on a single theme. It's a gripping body of work no matter how you look at it, because, to put it in a single phrase, Mitchell puts her whole being into it. Take her Angry/Forest photograph, for example. It is a photograph of Mitchell's performance attempting to express "frustration at a lack of communication". It's a great art-piece, largely because of the unexpected juxtaposition of the ordinary and the theatrical, the bare white walls and simple rug against the dramatic headgear and white face-paint. The headgear and makeup draw our attention to the source of the energy: we see the character's blocked eyes, the muffled ears, the back-tilted head, and the open mouth in the middle of a throaty primal yell. We can even see the frustrated energy trickling down her arms to her tensed hands. It's an important emotion to express, especially because it is one that is too often stifled. It is also one that is difficult to express well, with many performances slipping into either excessive negativity or smirking humor. In this performance, however, Mitchell expresses it honestly, deeply, and purely, without a hint of exaggeration. "Angry/Forest is part of a much larger piece all in the attempt to express frustration at a lack of communication," Mitchell says. "It includes video and movement, and hopefully in the future, it will include painting and sculpture, if it goes that way." That is Mitchell's new method of working. She gets the idea of a feeling to express, usually one that is felt by many but not often communicated. From there, she designs and makes one of her iconic sanctuary helmets, one of which you see in the photo, and then she puts it on, dresses the part, and expresses the feeling through a physical performance. After documenting the performance through photography or movie camera, she then sometimes creates adjoining pieces by digitally manipulating the image. And then sometimes, after that, she uses the digital image as the model for a new drawing, painting, and/or sculpture. By my count, that's at least five interconnecting pieces on the same theme, all overlapping, all building upon the previous piece. 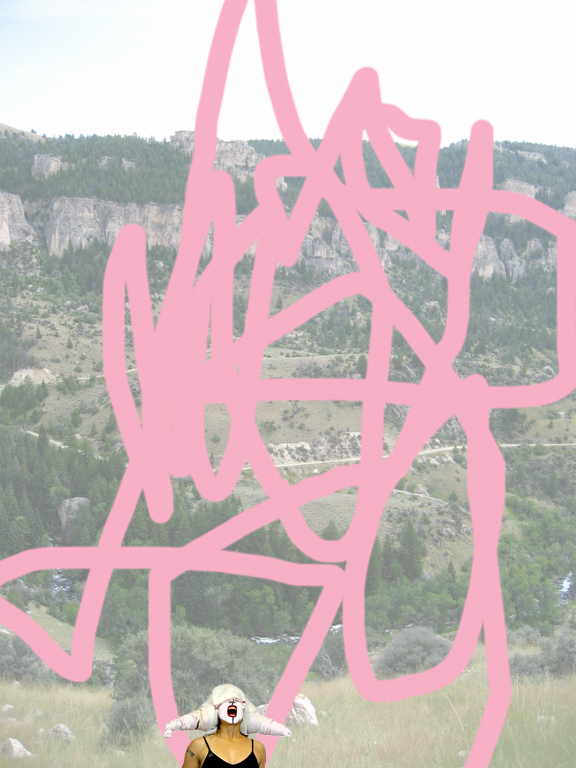 For her Angry/Wyoming image, Mitchell used a tall rectangular photograph of a Wyoming forest as the backdrop, she photoshopped in the Angry/Forest photograph, and then she added what looks like one single pink digital brushstroke to tie the two images together. Another point of interest in some of Mitchell's work is the theme of sound. Often in visual art, artists create without any thought about sound, creating a piece of work that only stimulates the eyes. But Mitchell often uncannily stimulates our sense of hearing as well. In Angry/Wyoming, for instance, our hearing is stimulated through the open-mouthed operatic pose of her character, through the pink visualization of the decibels or soundwaves of her scream, and also through the image of the Sanctuary Helmet which by blocking her character's hearing, brings out the impulse in us to cover our ears, as if the aural volume were coming right through the image. "I grew up as a classical ballet dancer, and have always had a relationship with my body. I lost that, kind of, when I went to art school. I thought I should focus only on painting, so I could be a painter. That worked for a while, until I really felt the need to move. 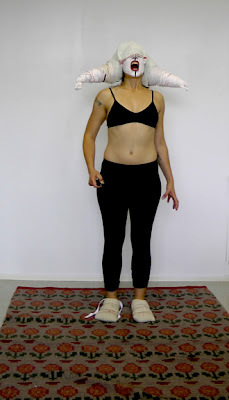 During my residency in Finland, I came out of my shell, and realized the best way to express a feeling was to literally express it through the body. The residency was a safe place to really explore who I am and what I do, and that verified my beliefs. For a while though, I wasn't sure what was happening. I thought I might be developing some crazy alternate personality thing," she laughs. "But then I realized after creating these works that I am more myself than ever." "I have noticed also that when my yoga practice gets strong, so does my art, because yoga gets you to that place where intense art-making can get you to. In other words, the more I practice yoga, the more inspired I become to create." "Enlightenment/Beacon is about that feeling when you know something, although people are trying to convince you otherwise," says Mitchell. The image is a collage of a performance done at Torrey Pines, photoshopped into a picture taken on Mitchell's honeymoon in Nova Scotia. And the slight image on the left side is from a performance in Finland. "I like the idea of combining time and place through collage, and I realized the performances can act as characters to one another, forming relationships," Mitchell says. When I asked Mitchell what she thinks about people creating their own stories around her pieces, she said: "I love when people make up their own stories about the work. I think when people make up their own stories, it makes the piece more accessible and more fun." Dark is certainly a piece that demands some storytelling on the part of the viewer. For me, the story balances mystery and humor. "The original performance for this photo was called Dancer, and it was about seeking freedom. I wore aluminum tape, originally used to patch ductwork, and goggles and a shower cap to restrict my vision and hearing. I tried to dance gracefully, although unsuccessfully. I love absurdity and humor in art, yet I try to retain a seriousness." The wealth of characters and theatrical elements in Mitchell's work calls to mind the work of Cindy Sherman, about whom Mitchell says: "I Love Cindy Sherman. I think because she, also, combines art and life through the medium of her body." As with her Sanctuary Helmets, Mitchell's often uses her hand-made Circles as backdrops or catalysts for her performances, but they also stand on their own. They evoke a sort of ceremonial feeling, and there is a portal like sense to them, as if we have come through them or are about to go through them. In that sense, they also have evoke a sense that the artist is inviting the viewer to undertake the same self-realizing journey that she is making. "The Circles are about coming full circle, in one's life, in the seasons, and life in general," Mitchell says. "I was also trying to relate people to the natural world, another theme that still runs with me. 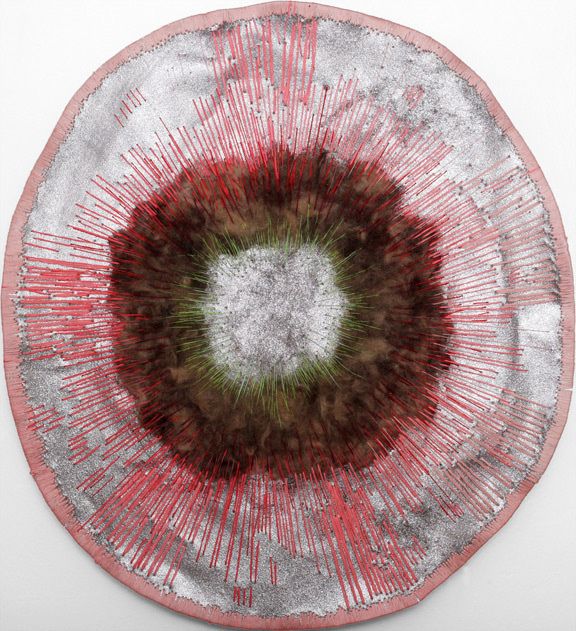 Dog Circle is made of embroidery thread, glittered canvas and fur from my dog Jack. I used to collect his fur after I brushed it, intending to stuff a pillow or make a tea cozy or something, but it turned into art," she laughs. "It's supposed to emit the feeling of some kind of galactic explosion." 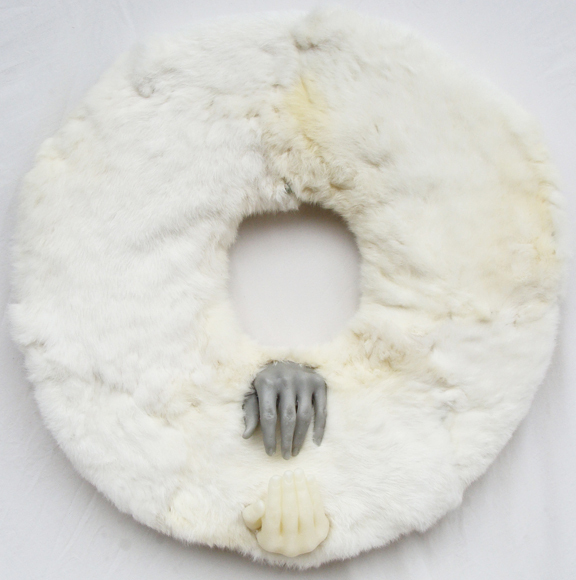 About the eerily beautiful Rabbit/Hand Circle, Mitchell says: "Rabbit/Hand Circle is kind of like a life ring, two hands of different people reaching for each other." Mitchell is currently applying to graduate schools, both in town and abroad, but wherever she goes, we can be confident that she will continue her evocative dance through media. We remain grateful for the tremendous gifts she has shared with us, which fortunately have the tendency to linger long in the mind and the soul.